For this flashback Friday post I'm bringing back one of the first recipes I ever posted. This was one my Mom used the way that one would use a white cake mix today. She'd bake it in a spring-form cake pan, slice it horizontally, fill it with fruit or pudding, and decorate it with whipped cream. It also served well as a jelly roll which she usually filled with chocolate pudding. I checked the Mennonite Treasury of Recipes and found about 8 variations of jelly rolls, obviously a favorite of days gone by. I believe traditional jelly rolls got their name because of the jam/jelly filling, but in our family we have always used a custard pudding such as vanilla, coconut, lemon or as already said, chocolate. Prepare 11x17 inch (or slightly smaller) cookie sheet by greasing bottom and sides, lining with parchment or wax paper and greasing again. I use shortening Preheat oven to 350 F.
In small bowl, beat egg whites until very soft peaks form when lifting the beater (turned off). Set side. In mixing bowl, beat sugar and egg yolks well, (I use a wooden spoon) until pale yellow in color, then stir in water, lemon juice and vanilla. Stir in combined dry ingredients, then fold in the beaten egg whites (with a spatula) until the egg white is blended in and the batter has a very light and airy consistency. Pour into prepared baking sheet. Bake at 350 F for 15 - 20 min. until pale yellow. 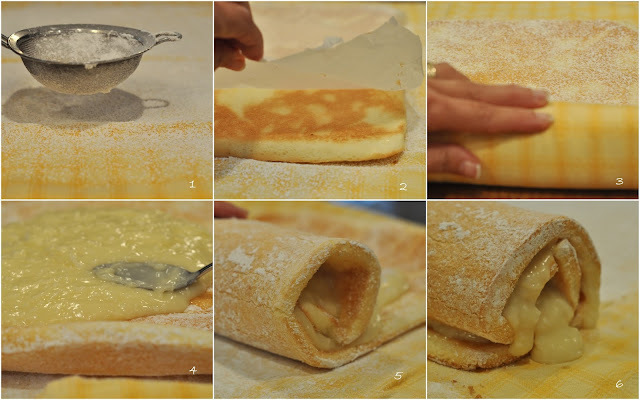 Dust with confectioner's sugar again and roll into a log, along with towel, beginning at narrow end. (3) Let rest to from shape for 15 - 30 minutes. Unroll, spread with 2 - 2/1/2 cups cooled pudding (4) keeping about an inch away from sides and a few at the end. Roll up again, starting at the same end, leaving the towel underneath. (5) Transfer log onto serving platter, using end of towel to lift, then slide towel out from underneath. Cover loosely with plastic wrap and refrigerate. Can be made day ahead. Dust with fresh powdered sugar before serving. Blend into hot milk as it begins to boil, stirring until it bubbles. Remove from heat. Stir in vanilla, coconut and butter. Let cool in ice water or cover with plastic wrap (placed right on the pudding) and refrigerate. Cake pictured is decorated with 1/2 cup whipping cream and 1 tsp sugar whipped, then sprinkled with toasted coconut. I stumbled into this site from Kristal's blog and I must say I am so thrilled. I love all your recipes and I am going to love baking all the other recipes,too. Annaliese can you submit the Chocolate cookies you had when we camped together. I have lost the recipe and I would like to make these cookies a camping special, too. Hi Alvina! What a nice surprise to get a note from you! I plan to get together with my Mom to make those cookies, since I'm not that comfortable with the glazing part. I will let her bake and I'll be the lovely (photographer)assistant. Oh my...here we go again...a list of 'to trys' for my next weekend. You make it look easy, is it? For sure this is one to try...won't I be impressing them at work with this one! Oh Anneliese .. I'm starting to recognize your recipes from the the picture. . . This looks so good. . I bet it's all gone. .shoot. . I'm thrilled to see that we will have an honourary blog guest. .tell your mom she is most welcome to bake while you photograph. . that will be a treat indeed. My Mom usually made a lemon filling for the jelly roll and sometimes jam. I always do lemon because that's my favorite filling. Thanks for posting this recipe Anneliese. Hmmm..jelly roll coming up in my kitchen. Yummy looking Anneliese! Beautiful photos.. I attmpted to make the jelly roll and it didn't turn out exactly how i would have liked. I am wondering if you could add to the recipe how long to beat the eggs. I think this was my problem - yet I wasn't sure how much beating they needed. Thanks for managing this blog. It sure is a neat place to get recipes and I love seeing the pics of what I am going to be making!! I beat the egg whites until they are a nice medium stiffness, then fold them into the batter (gently) with a spatula, until the batter looks nice and "airie" (sp?). Agnes, thank you! Love hearing about a first time success! Oh, it looks delightful! Thanks for sharing your recipes. Oh boy! Did it not turn out? I guess you could always turn it into a trifle? Hi, Anneliese. Thanks for the recipe. Could you please share the recipes for vanilla, lemon, and chocolate custards for this cake? for vanilla custard I use 2 cups milk, divided, 4 Tbsp cornstarch, 2 Tbsp sugar, 3 egg yolks, 1/4 tsp vanilla powder or 1 tsp vanilla extract. Follow the pattern of cooking for custards . . . heat 1 1/2 cups milk in saucepan on medium heat, while whisking together the cornstarch, sugar, vanilla, egg yolks and milk a little bit at a time to make a smooth mix which you stir into the hot milk and keep stirring until bubbly. OR you can use any packaged custard mixes to cook or even instant puddings which you shake up with milk. Oh my that looks good! Just love all the wonderful Friday flashbacks - ones I missed before I knew about this amazing blog!!! Great Recipe! I get getting asked for it!